Brite Wires are specially formulated to give your guitar a crisp attack, with the nickel plating adding a warmth to the overall tone. 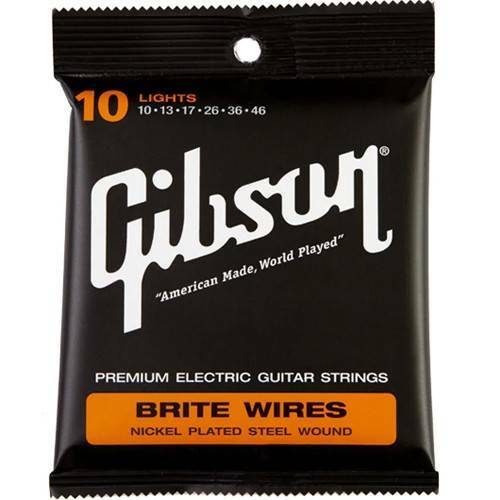 Brite Wires sound great on solid body electric guitars - especially those with high-output, dual coil, humbucker pickups - to deliver full bodied tone and long lasting sustain. Brite Wires performance come from their construction. They are precision wound using nickel plated steel wrap over a Swedish steel hex core so they tune up immediately and deliver excellent volume and sustain. Gibson ensures Brite Wires electric guitar strings are manufactured under tight quality control standards and procedures, using top-grade materials. This guarantees the perfect match between instrument and string will yield the true measure of quality: tone, durability and consistency. No matter what style of music you play, you'll hear why Brite Wires are the choice of professionals world-wide! Says Motorhead guitarist Phil Campbell: "I love my Brite Wires. They don't break. They don't rust. They never get out of tune. They have the perfect tone. Why change it if it's working? I trust 'em that much...."
Ive been buying these strings lately at L&M as well at future shop, both stores have them on for cheap 5 dollars a pack, so there priced the same as bargain brand strings and frankly I think they are of the same quality as earnie ball or d'adarios or ghS strings......but there a couple bucks cheap, nice getting 2 packs for 10 bucks - rather then 1 pack for 7:50 of the other brands mentioned...nothing wrong with these strings at all and beats any other 5 dollar pack out there.